The μPAC-5x07(P) series is a palm-size programmable automation controller. It has a 80186 CPU, SRAM, Flash, Ethernet port, RS-232 and RS-485 port. With a DOS-like OS (MiniOS7) and a developed firmware running inside, it can act like a small PC. For hardware expansion, it also supports an I/O expansion bus. The I/O expansion bus can be used to implement various I/O functions such as DI, DO,A/D, D/A, Timer/Counter, UART, and other I/O functions. Nearly all kinds of I/O functions can be implemented by this bus. The bus can support one board. There are more than 10 boards available for μPAC-5x07(P) series, you can choose one of them to expand hardware features. μPAC-5x07(P) is the model of μPAC-5x07 with PoE (Power-over-Ethernet). PoE allows power and data to be carried over a single Ethernet cable, so a device can operate solely from the power it receives through the data cable. This innovation allows greater flexibility in office design, higher efficiency in systems design, and faster turnaround time in systems design, and faster turnaround time in set-up and implementation. 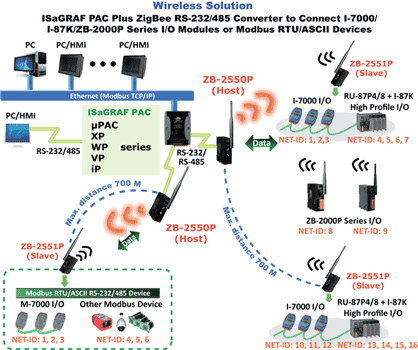 ISaGRAF PAC plus ZB-2550P and ZB-2551P (ZigBee to RS-232/485 Converters) can apply wireless communication, reduce the wiring cost, and achieve remote I/O control and data acquisition. 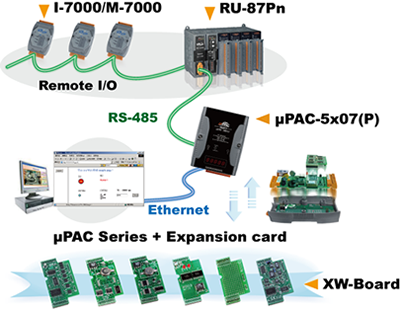 uPAC-5007(P)/5207 can support one I-87211W via COM1 (RS-232) or I-87211W/GPS-721 as RS-485 remote GPS I/O. 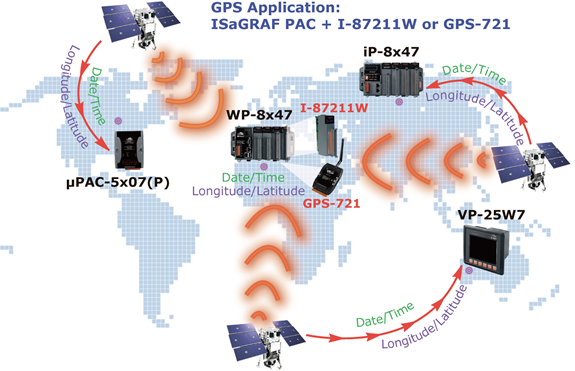 Note: uPAC-5107(P), uPAC-5307 has built-in GPS function. uPAC-5x07(P) Supports max. 3 I-7530 (RS-232 to CAN) Converters. uPAC-5x07(P) can send Email with one attached file via Ethernet Port. The maximum file size is about 488K bytes. One Email can send to 10 receivers at one sending. ISaGRAF PACs can use UDP/IP Client to auto-report acquisition data & control data to local or to remote internet PC/Server. Advantage: Each ISaGRAF PAC in the different location doesn't require a fixed Internet IP. The uPAC-5x07(P) provides Ethernet solutions. It contains 3 communication ports, COM1: RS-232, COM2: RS-485, Ethernet port: 10/100 Mbps Ethernet. 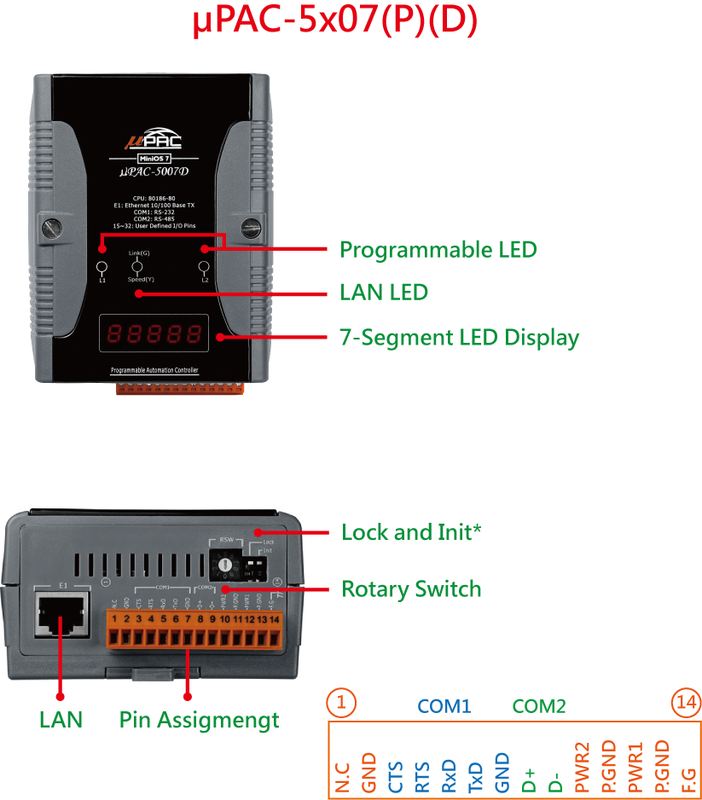 These different communication ports can provide various kinds of usage include RS-485 networking, controller to controller data-exchange, Modbus RTU/ASCII Master Protocol, Modbus RTU/TCP Slave Protocol, Remote I/O extension, linking with HMI/MMI, program download/upload, and debugging. Modbus RTU/ASCII (RS-232/485/422): max. 2 Modbus RTU/ASCII Master ports. Each uPAC-5x07(P) has an IP address and with a fixed port No. of 502. 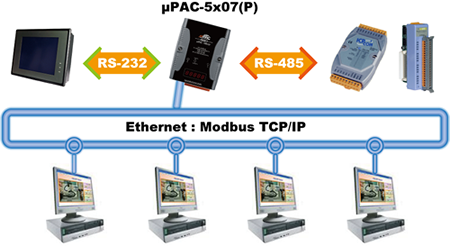 With Modbus TCP/IP protocol, up to 6 PCs can link to one uPAC-5x07(P) through Ethernet. With Modbus serial protocol, another PC or MMI can link to the COM1 (RS-232) port of the μPAC-5x07(P). Therefore, the maximum number of clients that can be linked is 7. Easy Duplicate System- Using the DCON Utility, you can easily make a backup of the I-87K module configurations and write to another RU-87Pn. The uPAC-5x07(P) has an I/O expansion bus which can plug One I/O expansion board. 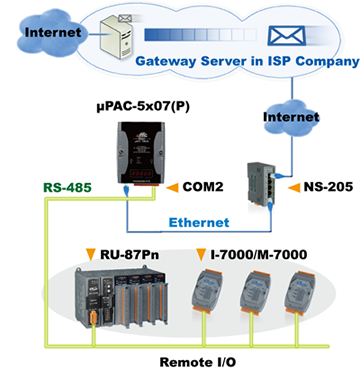 The uPAC-5x07(P) PAC can use its COM2 (RS-485) port to link to ICP DAS's "I-7000" & "I-87K" series of Remote I/O modules. This configuration can be very useful in applications that require distributed Remote I/O throughout the system. Each uPAC-5x07(P) can use its RS-485 port (COM2) to talk to each other via the Fbus communication mechanism. Fbus can be used to broadcast data to each controller or each controller can request to send or receive data from any other controller on the same Fbus network. Each uPAC-5x07(P) can use its Ethernet port to talk to each other via the Ebus communication mechanism. 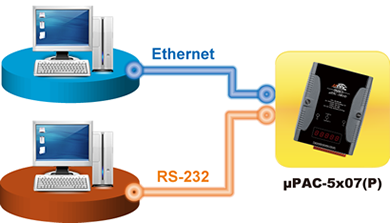 When PC is talking with controllers via Ethernet, the controllers can also talk to each other via the same Ethernet; It makes the configuration more flexible and faster. ICP DAS provides a freeware “UDLoader.exe” to load the data stored in battery-backup SRAM via RS-232 or Ethernet port. All XW-Board series DO boards support PWM output. Up to 8-ch for one controller. 500 Hz max. for Off=1 ms & On=1 ms. Available output square wave: Off = 1 ~ 32767 ms, On = 1 ~ 32767 ms.
All XW-Board series DI boards support DI counter. Up to 8-ch for one controller. Up to 500 Hz with minimum pulse width > 1 ms. Counter value: 32-bit. 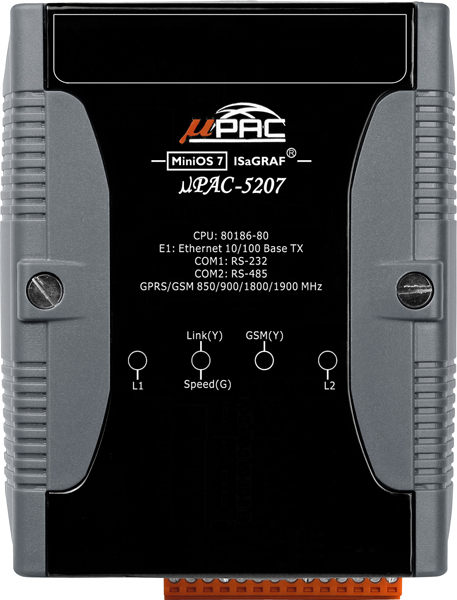 Note: uPAC-5207/5307 has built-in GPRS, no external GSM/GPRS modem required. Battery Backup SRAM 512 KB (Data valid up to 5 years, max. 1024 retain variables). FLASH 512 KB (100,000 erase/write cycles). microSD Expansion Yes (ISaGRAF doesn’t support). NVRAM 31 bytes (Battery backup, data valid up to 10 years). EEPROM 16 KB (Retention > 100 years; 1,000,000 erase/write cycles). 7-Seg. LED Display 5-Digit 7-Seg. LED on the front of μPAC-5x07(D)/5x07P(D). It can display message and value. Hardware Serial Number Yes, 64-bit hardware unique serial number. RS-232: TxD, RxD, RTS, CTS, GND, Non-Isolated. Baudrate: Max. 115200 bps, Program downloads port. RS-485: D2+, D2-, Non-Isolated, self-tuner ASIC inside. RJ-45 x 1, 10/100 Base-TX, Program downloads port. I/O Expansion Bus Yes (for one XW-board). Pulse Width Modulation Output All XW-series DO boards support PWM output. Max. 8 channels for one controller. Parallel DI Counter All XW-series DI boards support DI counter. Modbus RTU/ASCII Master Protocol Up to 2 COM Ports (COM1, COM2 and COM3-in-XW-Board) support Modbus RTU/ASCII Master protocol to connect to other Modbus Slave I/O devices. Max. Mbus_xxx Function Block amount:128. 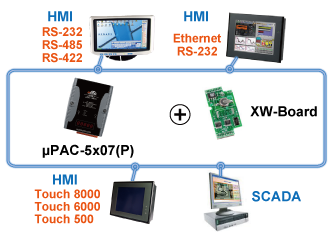 Protocol Up to 2 COM Ports (COM1 and one of COM2/COM3-in-XW-Board) can support Modbus RTU Slave protocol for connecting ISaGRAF, PC/HMI/OPC Server & MMI panels. 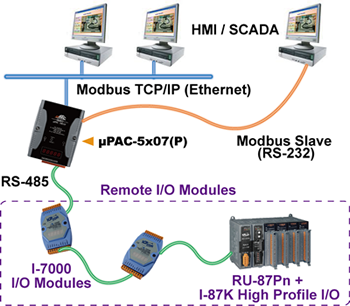 Protocol Ethernet port supports Modbus TCP/IP Slave protocol for connecting ISaGRAF & PC/HMI. Max. 6connections. Remote I/O One of COM2 or (COM3: RS-485 in-XW-Board) supports I-7K, I-87K I/O modules as Remote I/O. I-87K series must plug on RU-87P (High profile) or I-87K (Low profile) I/O Unit. Max. 64 I/O modules for one PAC. Fbus Built-in COM2 Port to exchange data between ICP DAS's ISaGRAF PACs. Ebus To exchange data between ICP DAS's ISaGRAF Ethernet PACs via Ethernet port. Note: μPAC-5207, 5307 has built-in GPRS, no external GSM/GPRS modem required. User-defined Protocol User can write his own protocol applied at COM1, COM2 & (COM3 ~ COM8 -in-XW-Board) by serial communication function blocks. 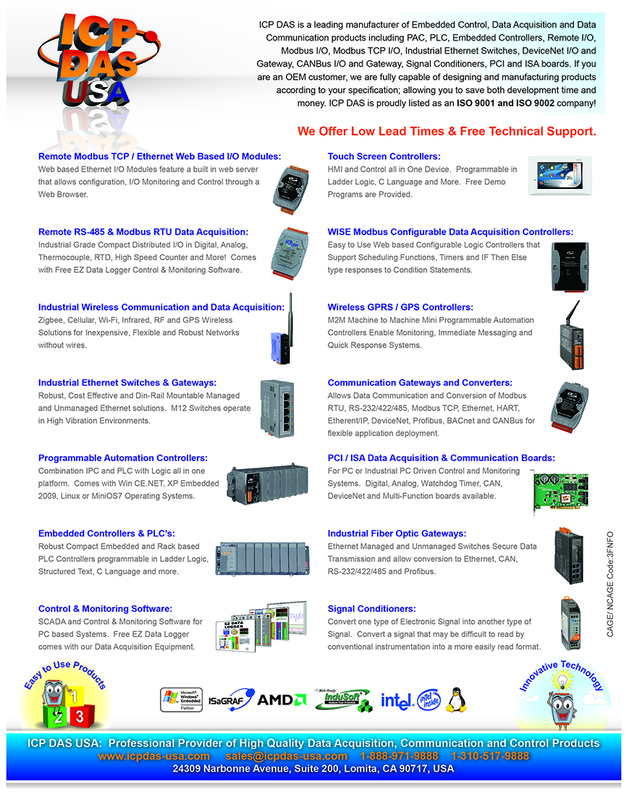 MMICON/LCD One of (COM3: RS-232 in-XW-Board) supports ICP DAS's MMICON. The MMICON is featured with a 240 x 64 dot LCD and a 4 x 4 Keyboard. User can use it to display picture, string, integer, float, and input a character, string, integer and float. Redundancy Solution Two PACs plug with XW107 in slot0. One is Master, one is Slave. Master handles all inputs & outputs at run time. If Master is damaged (or power off), Slave will take over the control of Bus7000b. If Master is alive from damaged (or power up again), it takes the control of Bus7000b again. The change over time is about 5 seconds. 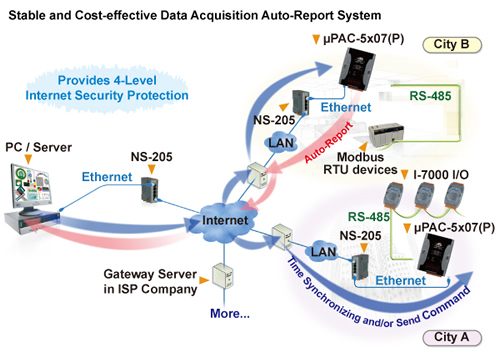 Control data is exchanging via Ebus (if using a cross cable, no require any Ethernet Switch). All I/O should be RS-485 I/O except the status I/O in the slot 0: XW107. 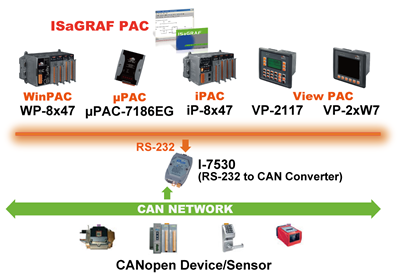 CAN/CANopen Use COM1 or COM3 ~ COM8 (at the XW5xx RS-232 X-board) to connect one I-7530: the RS-232 to CAN converter to support CAN/CANopen devices and sensors. One PAC supports max. 3 RS-232 ports to connect max. 3 I-7530 modules.